The Houston Independent School District’s Ascending to Men (ATM) Project will host a roundtable discussion next week with students and community leaders to foster dialogue centered around issues impacting today’s youth. The discussion will take place from 6 – 7:30 p.m., on Thursday, Feb. 28 at Jack Yates High School. Dinner will be provided beginning at 5:30 p.m. Participants will discuss the qualities of successful students, while sharing examples of how they can reach their personal and academic goals. Participants will also share their own perspectives on the importance of developing quality mentorships and the impact they can have on a student’s success. This entry was posted in Counseling & Guidance, High Schools, News, Parents, Special events and tagged Ascending to Men Project on February 19, 2019 by HISD Communications. 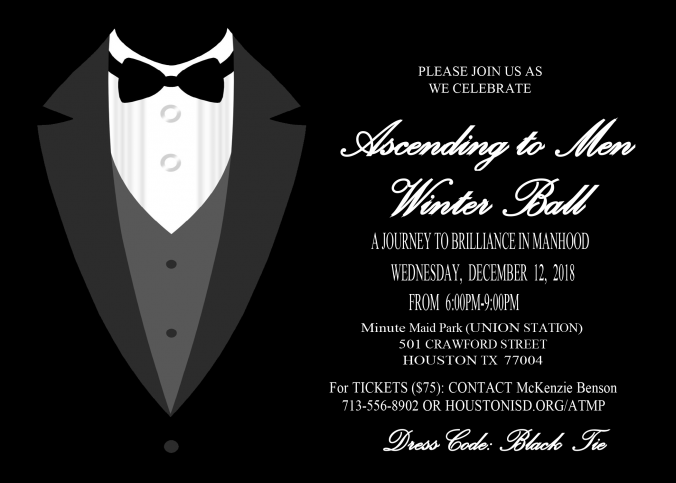 HISD’s Ascending to Men Project (ATMP) will host its first winter ball, Journey to Brilliance in Manhood, on Wednesday, Dec. 12 at Minute Maid Park. This entry was posted in FACE, News, Special events, Volunteers and partnerships, Wraparound services and tagged Ascending to Men Project on December 4, 2018 by HISD Communications.